The energy and the gifts of the Snowy Owl are deep and mysterious. As with all of the white animals, she signifies a purity that helps us work in darkness, certainly both our own and others. She helps us literally to see in the dark. We can see her white wings spanning outward as she brings back deeply tucked away secrets. Snowy Owl is an essential guide in the art of soul retrieval. As she brings back the psychic impressions of lost inner children and forgotten wounds and scars in the psyche, she also brings back news of ancient gifts, wisdom and deep insight into moving forward in life. Snowy Owl will help you learn to trust your instincts about people, places and situations. She represents the High Priestess within, who through your strong intuitive intelligence has a 360 degree roundhouse view of all that is occurring. This however, does not mean that what is seen is always spoken. For the owl is one of the most silent of all the fliers. And as a bird of prey that silence comes in very handy when approaching the target of any encounter. In soul retrieval, it can be necessary to remain silent until the time is right about what is seen. Snowy owl is the guide that lets you know when to speak and when to wait. On one hand, owls are considered fierce Night Eagles, as Native Americans call them, birds of prey who have no qualms about going in for the kill. And on the other hand, the owl is a pervasive symbol of silent wisdom, reminding us that insight comes from still and calm observation. Snowy owl can also signify a new level of maturity on your spiritual path and that you’ve been given more wisdom. Lastly, it can also mean that you are developing and evolving as a person. Snowy Owl's ability to navigate in the darkness makes her not only a master totem for soul retrieval and the reclaiming of lost parts of the soul, but she is also the guide that helps us go into the void of the Great Mystery to call forth ancient wisdom, knowledge and secrets that have lain dormant for ages to help us remember the fullness of our being, and create the new earth. Snowy Owl follows those who have the gift of Channeling the words of the elders via inspired written words or ~automatic writing, and helps us to discern the teachings correctly. 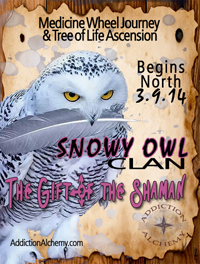 Snowy Owl will be our guide on the ascension up the tree of life in this journey, as we make the earthwalk. Like all Bird Totems, the Owl is considered to be a Messenger Totem, responsible for carrying messages from the Blue Road of Spirit to the Red Road of Physical Life. As such, he/she delivers omens, messages and information from the Elders to we of the Two-Legged as we journey along this Earthwalk. In Greek & Roman mythology, the owl was associated with the goddess of wisdom, Athena. Owls were said to guard the temple of Athena and were thought of as a sign of protection. If an owl was seen before a battle, it was sure that victory was to be had. Athena’s familiar was a “little owl”, as well as Nike who is also a little winged Goddess of Victory. They may actually be one and the same. Owl spirit animals are symbolic of death in many traditions. In most cases however, it should not be taken literally: If the owl is associated with death, it can be viewed as a symbolic death, meaning a transition in life, and a harbinger of mportant changes that are taking place or arre about to happen. If you are resonating to the energies of Snowy Owl, you probably enjoy exploring the unknown. The mysteries of life are a fascinating field of interest to you. As the owl guides your steps, you are likely to develop an appreciation for life’s magic. It may be time to listen more closely and look out for the subtle signs that are around you. Your animal spirit guide is a great helper to be attentive to what usually goes below your radar, but is now of particular importance. The owl is also a guide to uncover your hidden potential and abilities. It is now time to reveal more of your intuitive nature. Night time is particularly auspicious for your creativity, so take the time to focus your creative energy then. The owl sees in the dark: As a spirit animal, the owl guides you to see beyond the veil of deception and illusion; she helps see what’s kept hidden. She also symbolizes the ability to cut through illusions and see the real meaning of someone’s action or state of mind. When the owl is one of your power animals, you have a strong intuition and can access information and wisdom that’s usually hidden to most. The spirit of this animal encourages you to look beyond deceiving appearances into the true reality of a situation or a person’s motives. Snowy owl is a strong spirit guide for discernment and making decision based on solid foundations. She can help you assess a situation and clear up confusion. Fly with me in the deep night of your soul, to let go of whatever is keeping you from you Divine Identity. Let me lead you to reveal whatever does not have your best interest at heart. Who or what is stealing your energy? When someone steals your energy they are stealing your identity... there is a little less energy there to be who you are truly meant to be. Identity theft isn't just related to finances... energy vampires are real... Evil eye and envy are real. They have real impact on our health and energy levels, as well as our own identity. This is black magic. Yet, even so, the light always uses the dark, for also they are reminding us to go deeper into our own divine identity... to keep going to the place where our soul's expression shines like the sun, unapologetically for the glory of God/dess, to find the part of ourselves that cannot be stolen. It is so important to understand that even though we are one, we must have a true sense of Self before we can be truly selfless to bring our unique soul to glorify the whole of creation, otherwise it's just stolen energy. How would you feel if you found out that you were a Muse, a High Priestess, a Goddess? That you had the ability to communicate with the essential joy and beauty in everything, that you could see the code of creation, and the spirit of all things, the darkness of deception... and that through fantastical abilities to vision and impressions from the Masters, you could manifest any heart's desire and that you could create incomprehensible beauty beyond wildest dreams by calling upon the Master of Muses? That you could give flight to soul's desires? And what if you found out that you had agreed to come to a world where reality was lost in a sea of illusion, where true love was based on denial and beauty was only skin deep? What if like a genie in a bottle you could only grant the little wishes of demi gods, who have no ability to wish wisely? And what if you had such great powers that the Gods who made you had made it so you could only grant the wishes of others, but not your own to temper such a great gift? What would you do if you found this out for sure with 100% understanding of this knowledge of yourself? What would you do next? This journey will open you to the ascension work of your soul, by going deeper into your divinity than ever before. You are pure light, and as the light body comes alive, you become more and more real, get more rooted in the earth and are now a fit vessel to bring heaven to earth in the fullest measures. I see into the soul's of others and reveal all deception. I have the inner vision to put and end to lies and illusion. I see the truth of all situations. I trust my intuition to lead me to the light. I go into discernment and listen to my guides. I work with my holy trinity divine love, divine intelligence and divine will to use white magic in my life. I am a disciple of one love. I stake a claim for heaven on earth. I am a bringer of the new earth energies to humanity. I engage in socially conscious business in all my dealings. I am connected to my conscience, and can separate right from wrong. I can recognize when I am being lead down the path of severity and I quickly make correction. My light body is engaging more every day.